In addition, the remaining members of Tohoshinki, Yunho (24) and Changmin (22) will continue to be managed by the company (t/n: Avex). The TVXQ trio, Micky Yoochun, Xiah Junsu and YoungWoong Jaejoong, released the following official statement regarding Avex’s decision to halt the group’s activities in Japan. 1) The head of C-JeS has no ties to gangs whatsoever. Though his previous conviction is true, it was not a verdict made regarding any ties with gangs. Avex was fully aware of this fact before their contract with the TVXQ trio was signed, and as this cannot be classified as a breach of the exclusive contract, it cannot become a reason to halt activities or cancel the contract. Several months ago, Avex requested that C-JeS be excluded from the contract for such reasons, and the TVXQ trio agreed to such a request and actively participated in the discussions regarding the renewal of their contract with Avex in order to ensure that they would have smooth activities within Japan. However, Avex put forth conditions that were unfair to the trio unlike their previous contract, and when the trio refused to accept such conditions, Avex stated the gang ties of the head of C-JeS as a reason for canceling the contract, and finally released an official notice stating that no more activities would occur. While these details were being discussed, the TVXQ trio continued to diligently carry out all scheduled activities to keep their promise with their fans and worked hard to come to an agreement with Avex. 2) The victims of this situation are the TVXQ trio. Avex attempted to coerce the trio to comply to changes in the contract, but when the trio refused to agree to such conditions, Avex announced a halt in their activities with no regard to the trio’s opinions. Since the signing of the contract with the trio till now, Avex has involved the TVXQ trio in various activities aimed at raising the agency’s income such as concerts, Xiah Junsu’s solo album, participation in another Avex singer’s music video, and the recent ‘The…’ album. 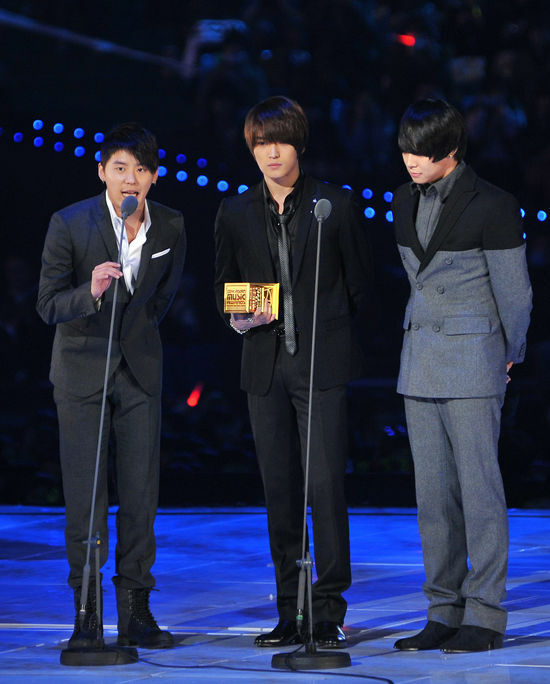 However, Avex has been putting forth unfair conditions to the TVXQ trio, contrary to what had been done in the past, for the past several months by using the past conviction of the head of C-JeS as a pretext, and when these conditions were rejected, Avex began discussions on canceling their contract and announced a halt in activities in order to corner the TVXQ trio. This can be seen as Avex taking all the money that they can from the TVXQ trio and then proceeding to create a situation that makes it impossible for the trio to sign on with any other agency in Japan, thus blocking the trio’s path with regards to Japanese activities. The TVXQ trio had no intentions of stopping their activities in Japan, and the announcement made by Avex reflected only the thoughts of the agency themselves. 3) Avex has made an illogical statement that the contract between Avex and SM Entertainment regarding the five members of TVXQ is still valid though they would suspend Micky Yoochun, Xiah Junsu and YoungWoong Jaejoong’s contract. Earlier, I tried sending a mail to Jejung, “Are you okay? See you soon~”, and then a reply came! “I want to meet everyone.” How these words are filled with emotion!! As expected, I will believe, and wait. These feelings didn’t change, and will not change. Every one, thank you! It has been found that the TVXQ trio (consisting of Xiah Junsu, YoungWoong Jaejoong and Micky Yoochun) already knew beforehand of Avex’s decision to halt JYJ’s activities in Japan. Regarding Xiah Junsu, YoungWoong Jaejoong and Micky Yoochun’s removal from Avex Entertainment, C-JeS Entertainment stated that they will have to look into this. 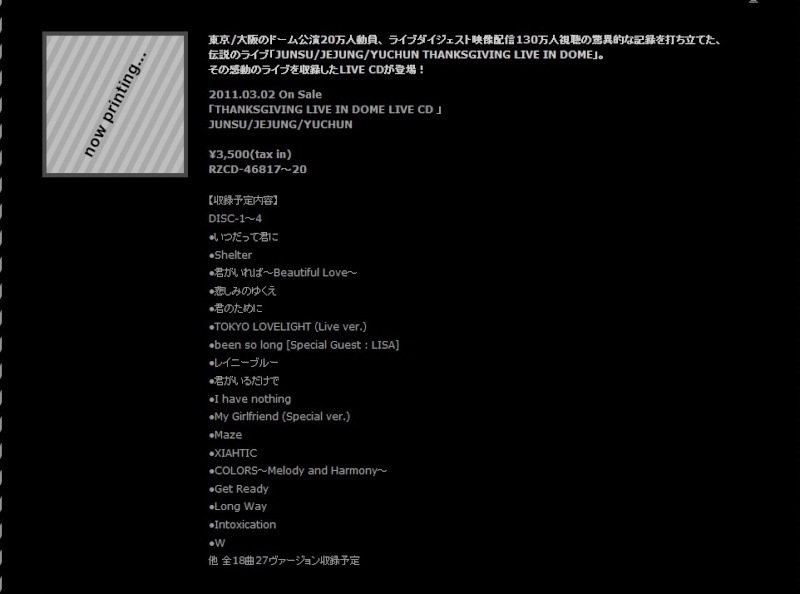 JUNSU/JEJUNG/YUCHUN will be halting all activities in Japan for the time being. The management company in Korea representing JUNSU/JEJUNG/YUCHUN, C-JeS ENTERTAINMENT CO.,LTD’s representative was reported to have been found guilty of using his father’s power and ties with gangs to blackmail the artist he was responsible for, and served time for coercion. Avex has been investigating the validity of news reports, and it was found that, though the speculations of the head’s ties with gangs cannot be verified, the rest of the report stated above was factual. Also, as the exclusive contract lawsuit is still progressing for JUNSU/JEJUNG/YUCHUN in Korea, the probability of our company’s exclusive contract with the company being invalid has become higher. As our company focuses on compliance, to comply with our business ethics and policies, until this issue has been resolved, we have decided not to continue with the management of the artists’ activities in Japan. To all the fans that support JUNSU/JEJUNG/YUCHUN, we offer our deepest apologies for the news that have caused you worry. In addition, regarding the companies above decision, we hope that you will grant us your understanding. With regards to the scheduled release of products and services that are ongoing, there will be no changes as of now. Also, SM Entertainment’s management states that there has been no change in the exclusive contract for the 5 members of Tohoshinki. As our company has often mentioned, we will continue to try our best to re-start Tohoshinki’s activities.